The first successful work in the United States rested on the shoulders of a 17 year old girl. In the spring of 1879, the newly named Salvation Army in London was so small that all the workers knew each other personally. Eliza Shirley, then 16, joined the Christian Mission and was appointed as an evangelist at one of the "stations." At first, her parents, Amos and Annie Shirley, were not sure they approved. Shortly thereafter, Amos, an experienced silk weaver, left for America and found a position in Philadelphia. When he sent for his wife and daughter, Eliza did not want to leave the Army behind. However, her father's description of the ungodliness he found in America convinced her that the Army was needed. 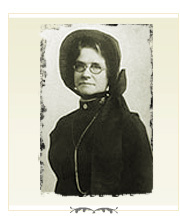 She called on General Superintendent William Booth and asked permission to start the work in America. By then, she had been commissioned a lieutenant and was doing well in her home corps, Coventry. Booth was not sure the U.S. was ready for opening, and reminded her that leaving would be a breach of her pledge. However, he softened enough to say that if she were unable to resist, she could go with his blessing. Further, if she were successful, he would give her work official recognition. Captain Elijah Cadman, her superior officer, presented 100 penny song books to take with her. By the time they reached Philadelphia, her mother shared her desire to begin Army work. They walked the streets looking for an affordable meeting place, finally settling on an abandoned chair factory. The family worked together to clean it up and get it ready for the opening meeting. Posters announced the appearance of "Two Hallelujah Females." Though they didn't have any standard uniforms, drums, or any of the glitter that attracted crowds, people flocked out of curiosity to their open air meetings. Eventually, the police told them they couldn't gather on the street any more. They found a vacant lot several blocks away, but afterwards no one followed their march to the hall. Providence arrived in the form of a tar barrel fire set by some boys on their lot. When the Shirleys saw the lot filled with people watching the firemen, they proceeded with a meeting. Their trophy was Reddy, the worst drunk in the area. When the people saw Reddy march to the hall, they followed to see what they would do with him. News of Reddy's conversion reached not only the local papers, but up and down the coast. Shortly after this incident, the Shirleys opened up another hall in West Philadelphia. When Amos's employer told him he had to choose between his job and the Army, he chose the Army. General Booth's reply to the American success was the promotion of the Shirleys to captain and the promise to send George Scott Railton to the country to take charge. Amos met with a fatal accident not many years later, but Annie and Eliza continued in the work. Eliza returned from a rest trip to England with a new husband, Captain Philip Symmonds, had four children, and lived well into her eighties. Retiring in Chicago, she became an ardent fan of the Chicago Cubs. As Eliza was on her deathbed, the Cubs were in the final games of the World Series. She drifted in and out of consciousness, alternately praying and asking how the Cubs were doing. When word came that Eliza Symmonds had been promoted to glory, there was a moment of silence in the stadium in honor of this gallant lady.